Posted in: Books. Tagged: mst3k. The Master, looming over Torgo. Another book down during my holiday reading marathon: I just finished Growing Up With Manos: The Hands of Fate by Jackey Neyman Jones. 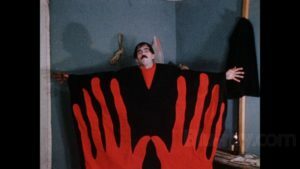 If you’re not familiar with the movie “Manos: The Hands of Fate“, it’s supposed to be the worst movie ever made, and if it’s not actually, it’s definitely high on the list. One of my favorite shows, Mystery Science Theater 3000, did a legendary show, introducing the movie to the world back in the 90s, after the movie sank into obscurity. After the MST3K episode, the movie developed a cult following, spawning sequels, musicals, and puppet shows. Written by the child star of the movie, Jackey Neyman Jones, _Growing Up with Manos_ explains the origins, production, and fall-out of “Manos: The Hands of Fate”. Jones’s account gives some interesting and surprising insights into many bizarre and puzzling aspects of the movie. For instance, the very long driving scene at the movie’s beginning was originally intended by the movie’s creator, Hal Warren, to play behind the credits, but after cutting the scene together, he decided it wasn’t quite long enough to contain the credits. So they were stuffed in haphazardly at the end. Jones’s story about her complicated but affectionate relationship with her father, who played the star role of the Master, sweetens the otherwise unsettling story of the film’s production: the film’s creator essentially conducted a confidence scheme to rope the stars and crew into helping with production on the promise of fame and fortune (and 200% stock in the production company). Although the book is an easy read (I read it in a few hours), it could have used a little more editing — several details of the story were told multiple times in essentially the same words. And if you aren’t already very familiar with the film, it would be a hard book to enjoy. But for the legions of Manos fans, _Growing Up With Manos_ should sit on your shelf, right next to your MST3K boxset.